Product is tested for Frozen Sections, Dot blot, Enzyme Immunoassay, Immunoprecipitation, Western blot / Immunoblot. A synthetic peptide corresponding to residues surrounding S312 of human IRS1. 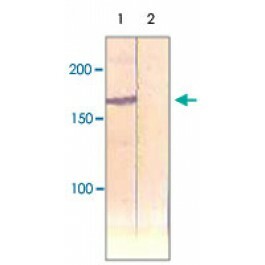 Rabbit polyclonal antibody raised against synthetic peptide of IRS1. This antibody recognizes ~165 kDa of human IRS-1 (without phosphorylation at Ser312). It also reacts with mouse and rat.